The Ukrainian president is content with the meeting. 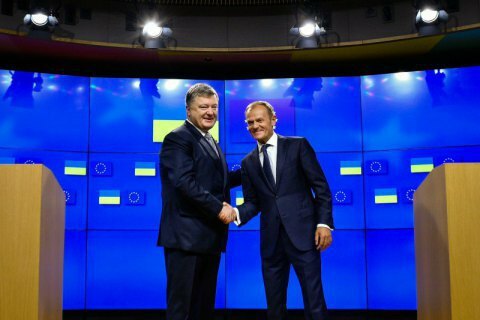 Ukrainian President Petro Poroshenko has met European Council President Donald Tusk in Brussels. According to Poroshenko's press service, they discussed cooperation between the EU and Ukraine, the Eastern Partnership summit and cooperation within the European People's Party. He recalled that ahead of the summit, the European Parliament had passed an absolutely clear resolution in support of Ukraine. “Everything we asked for received support and it was virtually a constitutional majority of the European Parliament,” he said. "I am extremely grateful to President Tusk for the absolutely clear, solid and consistent position of support for Ukraine’s European aspirations and sanctions against Russia as a consequence of Russia's aggression against Ukraine." Poroshenko stressed that he was fully satisfied with the results of the meeting with Donald Tusk. "By the way, I would like to use this opportunity to thank him both as president of the EU and as a Pole for a completely strategic vision of Ukrainian-Polish friendship. This is a responsible position of a responsible person,” he noted. Poroshenko is in Brussels to take part in the Eastern Partnership (Ukraine, Georgia, Belarus, Armenia, Azerbaijan, Moldova) summit on 24 November.